/ Comments Off on Back in the water. It’s Spring, since yesterday, and I’m swimming again. The familiar soreness of the arm and shoulder muscles, the cup of the middle ear sometimes retaining water until midmorning, the occasional feelings of wavelike or boatlike “floating” when I’m at my desk, working, hours after emerging from the water — all remind me that I’m back at it. That feels to me like the minimum I need to begin considering a long swim. A serious training plan would add mileage, intensity, and distance to this base, with longer pool workouts, a pool workout replacing one of the more relaxed weekday Bay swims, and progressively longer distance swims on the weekend, eventually building up to several hours at a time in cold water and waves. 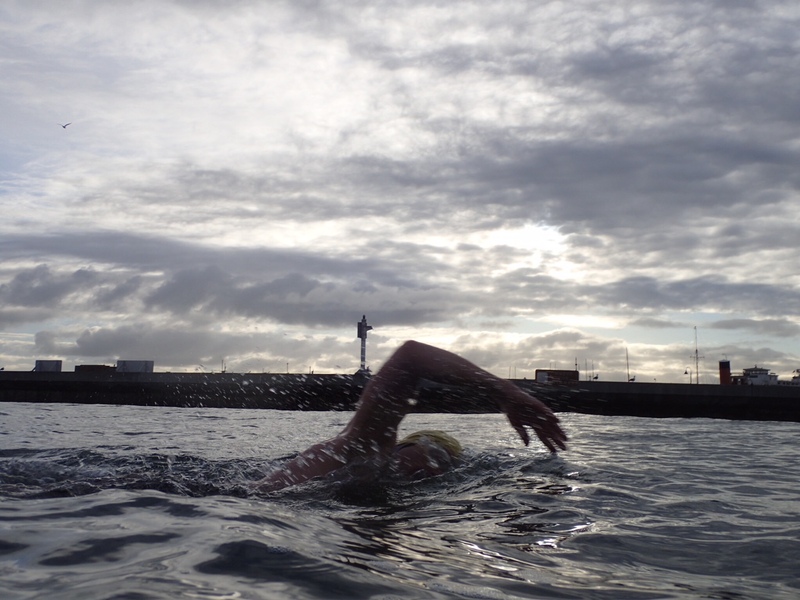 The rule of thumb for long-distance swims seems to be this: Train for about as many miles per week as the swim you plan on doing. So for a 12-mile swim, like a Tahoe crossing, 12 miles a week. For a 22.5-mile English Channel crossing, 22.5 miles a week. If you do the math, you realize that channel swimmers are putting in an enormous amount of time in the water before they ever start their crossings. Just finding a way to fit all that training into a busy week is a challenge. This is why the decision to plan for a long swim isn’t mine alone: I have to make it together with KJ, and the kids. If I do embark on a longer swim, the training means I’ll be waking up earlier, going to bed earlier, missing large parts of the weekend, and being tired and distracted more than usual. It’s not a decision I can make on my own. It’s not something I can undertake lightly. In the meantime, however, I’m simply blissed to be back in the water. Swimming nearly every day brings me joy and settles my brain. It makes me feel — to use a word that seems out of place when talking about an activity that involves floating in water — grounded.